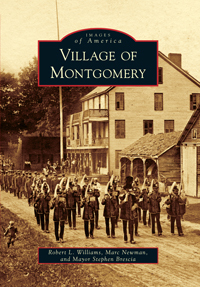 Did you ever wonder just what it is exactly that attracts people to the Village of Montgomery? In addition to the cared-for-homes and friendly smiles, it is a feeling of belonging and a sense of unity between neighbors, a sense of being needed and being available to those in need. It is demonstrated by our volunteers in the fire department and fire police, Little League, and Scouts. These qualities were handed down to us by our forefathers, men and women who gave their time and effort to create the Village as we know it today. Those very residents and business owners such as Skip Chambers, Phil Delessio, Vince Brescia, Marion Wild, and Charlie Snyder, whose values hopefully will be passed to future generations. Values such as hard work, sacrifice, and generosity were demonstrated, not just talked about. Phil Delessio, of Phil's Barber Shop, says for forty-two years he has been open for business on Clinton St. Back in 1958 a haircut cost $1.00 and kid's were $ .75 There has been a barbershop in continuous operation for 92 years at this location. Previous to Phil's shop was one run by Ralph Broas and Oni Wilson, two barbers who also raised chickens. Every day they would bring boxes of eggs with them to the barbershop to sell. You could get a haircut and buy the makings for an omelet all in one trip. At one point in time there were five full time barbers in the Village-and half as many people. There was Salvio out on Goodwill Rd, Phil, Angelo, Ralph Broas and Oni Wilson. Now we have one barber half the time and twice as many people- Go figure! Village history can be recorded sitting in the barber's chair or in the seat by the barbershop window facing the old post office. This is the best place to watch the comings and goings of the Village electricians, plumbers, workers, and secretaries. Retired folk enjoy critiquing the populace as they wait their turn in the chair. On this side of the glass window, time stands still. A rotary dial telephone, still in use, hangs in the corner. The spirits of Jack Conroy, an Agway employee, Jack Fisher, an instrumental figure organizing the original Village Little League, and Tom Procopio are kept alive by the stories told about them. Orie Huddleston, the village sign painter is recalled when he once lettered "Baldie" on some guy's parked car while the guy was shopping in Howard's (Howard Reiss') store. For a quick job, it looked quite professional! Herb Karsten, the village mechanic, was known to take the time to clean up the old spark plugs or refurbish a part, rather than charge the customer to replace with new, when doing a tune-up. Buddy Wild, the welder who had a shop on the corners of Wallkill Ave. and Charles St., was always willing to repair a kid's bicycle for free. Louie Brescia (Brescia Lumber) kept a roll of cash behind his tie, just in case someone in need came to him. Mr. Brescia was a very generous man who never pressured a debtor who had a hard time paying his bill. Skip recalls the Santoro brothers on their route going door to door with the Sunday newspaper. Also, in those days you left a card in the window for the ice man to let him know if you needed a 5 cent or 10 cent chunk of ice. Step out on Clinton St. Phil remembers Joe Haskins (Haskins Harness Shop) had a lady customer who came in regularly to have her knitting needles sharpened. They eventually were so worn that he was unable to get a good point on them any more, so he went out and bought her a new pair. She, thinking they were the originals, was thrilled with great job he did sharpening those needles! Joe also liked to treat the village kids to rings made out of horseshoe nails. Charlie Snyder operated a grocery store right next door to Phil's barbershop. Charlie remains a Village resident and is fondly remembered as a kind and generous businessman who helped keep a supply of food in many homes during many trying financial times. One long-time former Village resident remembers her mom sending her downtown to "Charlies" for fifty cents worth of spiced ham, which would be enough for six sandwiches. Phil recalls a period approximately 40 years ago when Andy Joyce was mayor. The entire one car police force consisted of three officers, Babe Mangione, Ike Iacuniano, and John Matthews. John says the only time he drew his gun was during a traffic stop when he saw someone in the back window of the car quickly wave a long object. Not knowing whether it was a rifle or shot gun, he drew his weapon in defense, but did not fire. The object turned out to be only a broom handle being waved by a child! Barber Delessio remembers a time that the Village Dept. Of Public Works didn't own a salt spreader. Edgar Ayers, Sr. would drive the truck and Frank Olson would toss salt off the back of the truck with a shovel as they drove though the Village. "Doc" Ehrenhaft, his office up on Union St., was known for his fair treatment of his patients, always giving the less fortunate a break. He brought many people into this world and was present when many left this world. Skip Chambers, son of Wilmot and Kathryn Chambers, remembers his grandfather finishing up the chores at 6 pm and heading downtown to the barbershop for his nightly shave. Chambers barn was home to many horses brought from out West. In 1964, Skip remembers having to give up raising milk cows. Apparently the traffic had gotten so heavy on Cochecton Turnpike (Rte. 17k) that the Chambers were unable to cross the cows to be pastured on the other side of the road. There were many farmers back in those days. The local fire departments would help clean out a barn and hold a dance before the season to fill the barns with hay commenced. Right up to the 1960's John Matthews recalls dances being held in Enright's old barn up on Allard's Corners. From 1938 to some time after W. W. II Skip Chambers fondly remembers every Tuesday night when his grandmother, Bell Chambers, gathered the family up, hopped in the car and headed down to Clinton St. You had to leave the house early, at 5:30, to be sure to get a prime parking spot, or you wouldn't be able to see the activities or hear the music well. All the vehicles backed up to the curb across the street and faced the bandstand, which was located where the old post office sits. What a sight! The George Washington Band, and members which included Tom Harris, Glen Erikson & Mel Bettcher, played marches and many old tunes for the enjoyment of the Village residents, young and old alike. The ladies from the local churches showed off their skills selling homemade cakes and desserts to the audience. The music would start at about 6:30 and continue until 10:00. There was no television back in those days, so outdoor musical entertainment was a real treat! If you were in good voice, you could perform on stage and sing a tune or two to the crowd. Back in those days little towns were built around the bandstands. Even the kids loved it. Skip says if you visit Europe today you would see that the town centers have been preserved because of the continued activities at the local bandstand. John Matthews, a regular visitor to Phil's Barbershop, tells of the time during the 1950's when sports car races were held at what is now the Orange County Airport. Famous racers from all over the world competed. Later drag racing, with big names, like the "Green Monster", became popular at this sight. As we enter the twenty-first century many people feel a sense of isolation due to working outside of the local area and due to the influx of new residents unknown to each other. Years ago most Village residents were born, raised, schooled, married, and died in the same community. A feeling of continuity and of being needed was experienced. Long time Village residents knew they were a part of something larger than themselves. They had a sense of community and connection, working together toward common goals such as band concerts, parades, celebrations, and beautification. Working hard all week and allowing time for family activities was the general attitude of the time. Village businesses gave and continue to give of their time and goods to promote Village events. As we go forward let us not forget the lessons taught to us by our Village forefathers. Let us do all we can to keep their sacrifices from being forgotten. Perhaps together we can find ways to recreate the enjoyable and memorable moments, like those experienced in the past, by which our children will remember us. Your contributions of ideas, wisdom and stories would be appreciated to attain this goal.